The Pirates have officially fired John Russell. 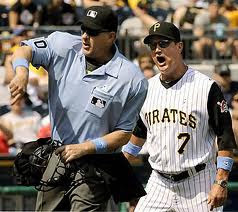 Names already being thrown around for the next Pirates manager are Eric Wedge, Ken Macha, and more hilariously, Bob Walk. No, no and no. They should hire my choice. Also today, Neil Walker won the Roberto Clemente award from members of the Pittsburgh chapter of the Baseball Writers Association of America.